The musical soundtrack for Terrence Malick's The Tree of Life is more so a vital element of the cinema experience than it is in almost any other film. What with an amorphous narrative, fantastical jumps between acts and non-linear story arc about mankind's relationship with nature and the divine, it is left to Alexandre Desplat's score to somehow guide moviegoers in what to feel. 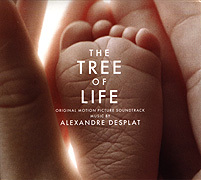 The Tree of Life (61'14") CD features 13 compositions by Desplat (and does not include the many other pre-existing classical and symphonic pieces by other composers also heard during the film - nor does it include yet another hour's worth of music made during The Tree of Life recording sessions). Although Desplat's music is an integral part of the film, it is equally wonderful to listen to this work all by itself. The Tree of Life can sit comfortably on the shelf next to textural works by Rick Cox, Michael Jon Fink and John Luther Adams as well as the prolonged sustaining symphonic movements of Philip Glass, John Adams and Arvo Pärt. With this in mind it follows that the CD does not play very much like a conventional soundtrack album. 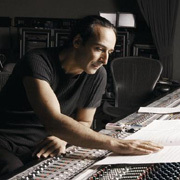 Desplat's pieces move between those with the fullness of an entire orchestra to others of a spare and elemental beauty - here finding the composer himself at the piano. "Flowing like a body of water throughout the film" Desplat's music achieves an elegant melancholy and innocence, on to a more kinetic mood of arpeggiated notes and repeating phrases. In one place the score extends the orchestra towards an experimental dissonance, then floats back to the comfort of lilting harmonies and evenly spaced piano melodies. With or without the film, encountering this beautiful work is gratifying - as it proves the old adage, where words fail, music speaks.